This post discusses all the commands you need to know to uninstall Microsoft store apps on Windows 10. When you install Windows 10, it also installs a wide range of apps like 3D Builder, Get Office, Skype, News, Weather etc. Though some built-in app like Photos, Movies & TV, Camera, OneNote, etc., are quite useful and helpful for the most part, other built-in apps are unnecessary. Take 3D Builder app for example, unless you enjoy building 3D models this app is pretty useless for most people. Generally, for apps you manually install from Microsoft store, you can uninstall them by simply right-clicking and selecting the "Uninstall" option in the start menu. What makes these built-in apps annoying is that, more often than not, you cannot uninstall them like the regular store apps. In fact, the uninstall option is entirely blocked in the Settings app and you can't even see the Uninstall option when you right-click on the app in the Start menu. That being said, you can uninstall store apps on Windows 10 using PowerShell. To uninstall any built-in store app, you first need to get the app package from PowerShell and then remove it. Here's how to uninstall Microsoft store apps. Before proceeding, create a restore point so that you can go back to know good state if needed. First, open PowerShell with admin rights. Otherwise, you will not be able to run below commands to uninstall Microsoft apps on Windows 10. 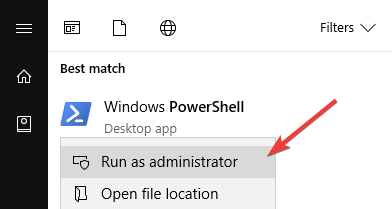 To open PowerShell as admin, search for "PowerShell" in the start menu, right-click on it and select the option "Run as administrator." Now copy the below command, right-click in the PowerShell Windows to paste it and press Enter to uninstall all store apps for all users on Windows 10. As soon as you execute the command, Windows will scan your system and uninstalls all Microsoft store apps excluding the apps that cannot be uninstalled like Cortana, Edge, Microsoft Store app, etc. Even after you uninstall the apps for all users, when you create a new user account, Windows will automatically install all the built-in app for that new user. If you don't want that behavior, execute the below command. This will prevent Windows from installing the store apps for new users. If there is a particular app that you wish to uninstall, then you can use the below commands to uninstall the target store app. This makes it so that you don't have to uninstall all pre-installed store apps just to remove one store app. To get started, open the PowerShell window just like before. Now, find the app you want to uninstall from the below list and use the command below it to uninstall that particular app. If you are looking for an explanation of the commands used to uninstall Microsoft apps then you can find it at the bottom of the list. 1. Uninstall Get Office or Office Hub app. 2. Uninstall 3D Builder app. 4. Uninstall Calendar and Mail app. 5. Uninstall Alarm and Clock app (removing this app won't affect your taskbar or Windows clock). 7. Uninstall Get Started app. 10. Uninstall Bing maps app. 11. Uninstall Movies and TV app. 17. Uninstall Microsoft Store (only do this if you know what you are doing). Instructions to Reinstall Microsoft store app. 19. Uninstall Voice Recorder app. 20. Uninstall Get Help app (this app is used to get direct support from Microsoft). 21. Uninstall Paint 3D app. 23. Uninstall Print 3D app. First, we get the store app package details using the Get-AppxPackage command. Then, we are uninstalling that store using the Remove-AppxPackage. You can uninstall most of the built-in Microsoft store apps in Windows 10. However, there are some apps you just cannot uninstall. Those apps include but not limited to Edge browser and Cortana. Uninstalling unnecessary apps is good because it lets you free up some space and remove clutter from your system. But if you ever want to reinstall built-in store apps, you can do that by executing a single command in PowerShell. Again, open PowerShell with admin rights and execute the below command. It will scan your system and reinstalls removed or uninstalled Microsoft store apps for all users on your system. Depending on the number of apps that need to be installed, it can take a few minutes to complete. Do keep in mind that some or all the built-in Microsoft store apps will be reinstalled automatically when you install a major Windows 10 update. So, bookmark this post. This will let you either uninstall Windows store apps or reinstall them as and when needed. I will also update the article with instructions for any other uninstallable Microsoft store apps when they come. I tried to list all the apps that are safe to uninstall from Windows 10. If you think I missed some store app then let me know in the comments section. I will add the relevant instructions as soon as possible. Hope that helps. Comment below sharing your thoughts and experiences about using the above commands to uninstall Microsoft apps on Windows 10. I enter the suggested command/s into powershell (running as admin) and nothing happens, it just gives me a new line to enter a new command, no execution of anything…? That is normal behavior. When an app is successfully uninstalled, you will not see any sort of response in PowerShell. It just gives you a new line for another command. That being said, while the uninstallation is in progress, you will briefly see deployment progress which vanishes almost instantly. I’ve just tested a few of the above-listed commands on the October build and they are work just fine. I don’t know how I forgot to list the uninstallation command for Groove Music.